Dead baby alewives are seen along Union River. The Downeast Salmon Federation is monitoring reports that thousands of baby alewives are being killed as they swim downstream through or over the Ellsworth dam. The Downeast Salmon Federation is monitoring what its biologist calls “a massive fish kill” on the Union River below a Brookfield Asset Management dam in Ellsworth. A spokeswoman for Brookfield, meanwhile, said that Downeast exaggerates the number of fish killed and that the dam owner is working with several agencies to limit environmental damage. 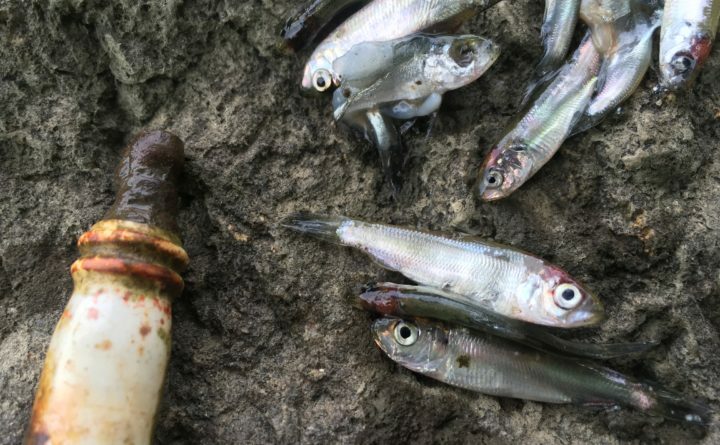 The fish kill apparently began Tuesday, as thousands of baby alewives and other species unsuccessfully tried to swim downstream through or over the dam, said Brett Ciccotelli, a fisheries biologist for the federation. “The flow of the river has been full of dead or dying baby river herring, their scales, their fins, their eyeballs. This is may sound gruesome, but this is the reality,” Ciccotelli said Friday in a statement. “In fact, it was our staff and not an outside entity that observed large outmigrations of juvenile alewives and altered our operations accordingly,” Edwards said in an email. “We are monitoring the situation and responding to real-time conditions. We will continue to work with relevant agencies as things develop,” Edwards added. The vast majority of juvenile alewives continues to pass through the dam safely, she said. Brookfield is seeking to relicense two Union River dams it owns. The The Federal Energy Regulatory Commission is reviewing the applications. The hydroelectric dams, owned by Black Bear Hydro, have a combined generation capacity of 8.9 megawatts and would be re-licensed for another 30 years, according to FERC. The relicensing application is for two dams each roughly 60 feet tall, one of which was built in 1907 and forms Leonard Lake in central Ellsworth and the other of which was built in 1923 and forms Graham Lake on the city’s northeast limit. The relicensing application has drawn the attention of conservation groups and shorefront residents of Graham Lake who say the design and operations of the dams are not environmentally friendly.